In 5 years, you will be the same person aside from the books you read and people you meet. I tried to escape it as a 5th grader, perferring Scooby Doo instead unless it had to do with science. I’m still a lover of non-fiction. Mostly biology. I got into it with the Harry Potter books, then lept to Suze Orman, Suzanne Sommers and Dave Ramsey. I downloaded the Overdrive app which allows me to borrow e books for free from my Montrose Library. When I figure out how I managed to get the book on my phone and tablet, I will share. It’s an elaborate e-pole-vaulting type trick involving Overdrive, Amazon and Kindle. Meanwhile, I just finished “Smart Money Smart Kids” by Rachael Cruze and Dave Ramsey and “Knockout” by Suzanne Sommers. I’m mentioning Chappie a lot these days. I love him. I was spellbound by “Knockout” in the first few pages. If you have ever been chronically ill or lost a loved one to cancer, you must read this. I have seen what cancer did to my beloved stepparents. Within weeks, each parent was already gone. In their place was a shell of a person that somewhat resembled them in speech but the light was gone. It was as if they were behind a gauze curtain and I couldn’t reach them. I promised my husband that I would never do chemo. Never. 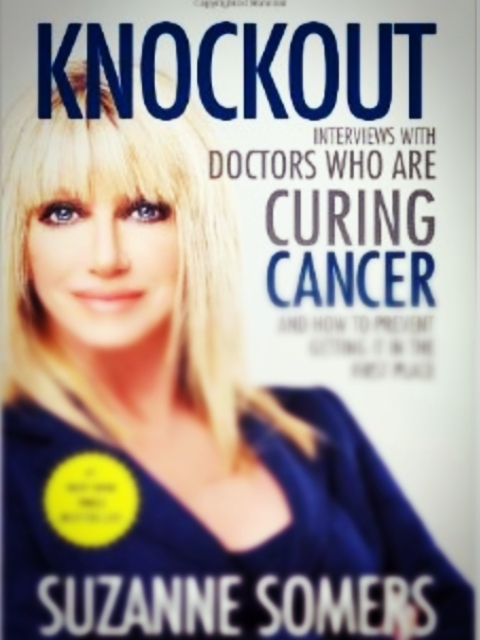 Suzanne’s explanes the biology, nutrition, and lack of peptides in cancer patients. Bioidentical hormones as cancer protectors. I know that Bi-est and Pro-gest have given me a great quality of life for 13 years and kept me a very young 47 year old. You will have to rip these out of my cold, dead hands. Correction, dead hands. I have Reynaud’s and my skin is always chilled. I have vampire skin…just ask my husband. I think that reading many wonderful books has allowed me good health to travel the world and meet amazing people who I have helped and who have helped me. *Pimsleur Mandarin Chinese I CD set. My car was my classroom and opened up another continent for me. I speak Spanish, some French and some Mandarin now. Instead of yelling at Houston drivers I would say “where is the hotel?” in Chinese. What if we all spoke the same languange? yes, I got to meet him and Chris Hogan. I got to meet him. Dr Fred Emmite, my nutritionist who will have helped me lose nearly 40lbs when I reach my goal. Thousands of ladies hurting and helping on FB’s Endometropolis. Many new Chinese friends in Chengdu （including a baby panda who seemed kind of like a person）, Xi’an, and Beijing. They don’t see many Westerners in China and it’s very rare for a Westerner to attempt Mandarin with them. It blows their mind. It makes them smile. I like being that person. My Grandma will be 102 this fall. I still have A LOT to learn. Including how Overdrive really works.